The UK has become a nation of coffee lovers. We just can’t get enough of cappuccinos, lattes and Cafe Mochas – to name just a few of our favourites. So, it’s no surprise that many of us have taken to recreating the coffee shop experience at home. And, one of the most affordable ways to do this is to buy a milk frother. 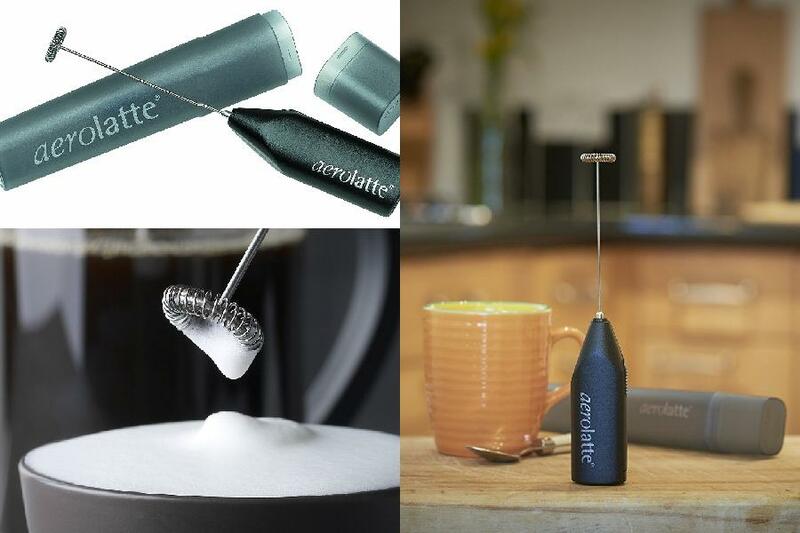 These handy little gadgets are a very viable way to create milk-based coffees at home for a fraction of the cost of buying a coffee machine or paying for coffees in Starbucks or Costa every day. 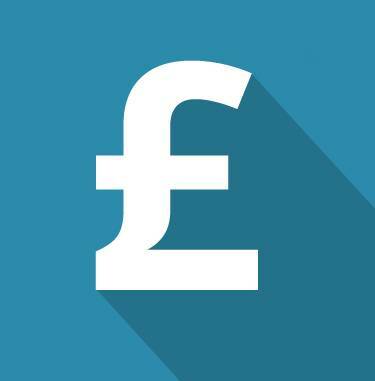 In fact, you can pick up a basic unit for as little as £5 – £10 right up to fully featured units which cost around £100 – and everything else in-between. There really is something for everyone. But, What is a Milk Frother? In its simplest form a milk frother is a whisk which can be used to aerate milk into a rich, creamy foam. Some units will heat and foam the milk at the same time for a hands off experience. Whilst others need to be heated on stoves or in the microwave and then manually frothed to produce a foam. 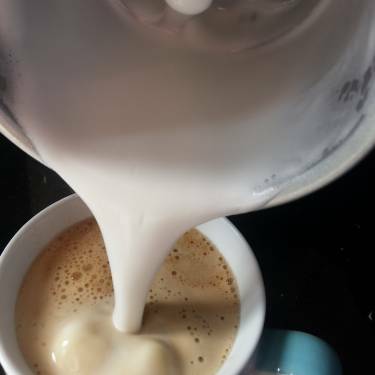 No matter how the frother you choose prepares the milk, the end result is the same: you’ll have a convenient facility in your home to prepare almost any kind of milk-based coffee for literally pennies each time. The Vonshef 13/085 might look familiar to other units you’ve seen on the market. And, well, that’s because it is. It features (what we assume) is standard base unit common to a few models offered by different brands – with a few differing features such as the handle style and colour. But don’t let this put you off. The reason this is standard design is because it works, and it works very well. The 13/085 comes in red, silver or copper and features a double walled stainless steel body – to ensure your milk is kept warm for a good while after you’ve prepared it. The Vonshef sits on top of a base plate and can be removed for easy serving which means you’re not tethered to the wall by an electric cord. Using this frother is also very easy and it comes with two main modes and two different mixing heads which can be swapped out in seconds. One will obviously froth the milk and the other just stirs it. The head which is not in use is very conveniently clipped in to the supplied plastic lid so it won’t get lost. Inside the device you’ll find a non-stick coating with two clearly marked fills lines. One gives you the fill line for simply heating and stirring the milk, the other for frothing the milk. We recommend you pay attention to these fill lines because during our tests we accidentally overfilled the machine and, despite coming with a sealed plastic lid, the milk will overflow and make a mess – you have been warned! Once you’ve placed your milk into the device a quick button press is all that’s required to get the machine going. However, if you decide you’d like cold frothed milk all you need to do is press and hold the power button for two seconds. This tells the device to run the frothing cycle but NOT to heat the contents. It takes around a minute to prepare your milk and the front mounted indication light will flash when it is ready. On average we were able to just about get two regular sized cups of cappuccino out of this device. Although if you have larger, cappuccino mugs you’ll only be able to prepare one drink at a time. But given how quickly it can prepare the milk this shouldn’t pose any real problems. Cleaning is also very easy. The whisk head simply pulls out for rinsing and the inside can we wiping and rinsed clean in seconds. The Vonshef 13/085 is a great little unit. It’s speedy, does the whole job for you, can prepare hot and cold drinks and is a breeze to clean. It’s stylish case doesn’t take up any room in the kitchen and it can be easily tucked away in a cupboard after using it. 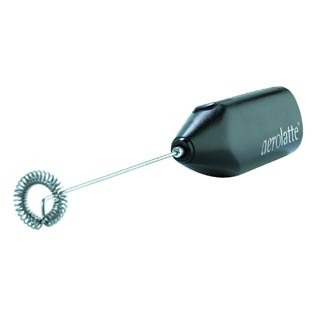 Overall we think its a great value frother. 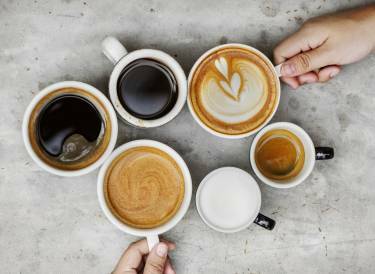 Who said creamy cappuccinos, lattes, mochas, and the rest are beverages you can only enjoy by spending a couple of bucks at your favourite coffee shop? With an automatic milk frother at home, you can enjoy all the cups you want of various specialty coffees. And, after researching what the market has to offer and comparing different products, we have come up with a shortlist of what we believe are some of the best milk frothers available today. Second on our list is the Lavazza 18200057. This glossy red milk frother with a touch of black and chrome not only looks great but is also an expert at what it does. It operates quietly, lets you know when your frothed milk is ready, and can be used to make more than just coffee at a time. To help you familiarize yourself with the Lavazza 18200057 Milk Frother, we delve into its various features below as well as a quick overview on how to get the device up and running. One thing to love about the Lavazza 18200057 Milk Frother is that it is designed to be easy to use. 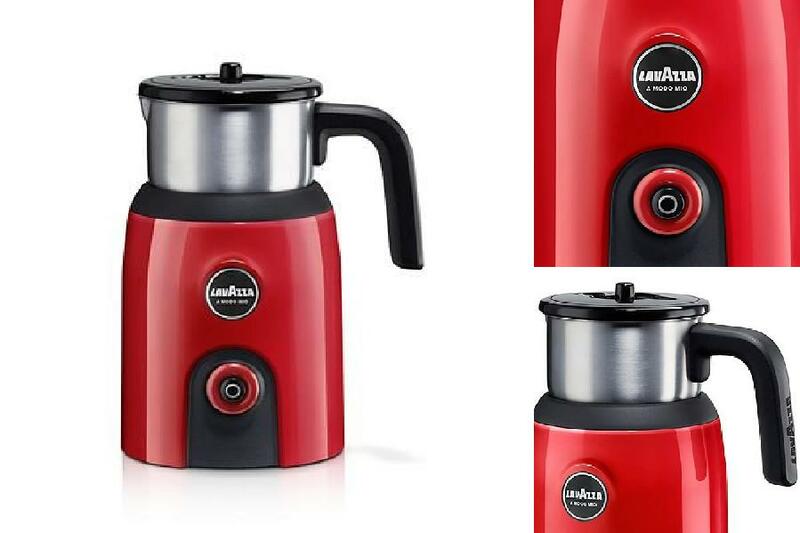 It features a very simple design of 3 major components – a lid with a crown-holding slot (which is what Lavazza refers to the stirring/whisk attachments as), a milk container with handle, and a milk frother base with a power cable attached to it. Also included are a couple of accessories (a notched & a smooth crown), which lend the appliance versatile functionality. The icing on the cake however, is the fact that the Lavazza 1820057 only has one multifunction button that turns the device on & off and prepares your milk in almost anyway you need it! 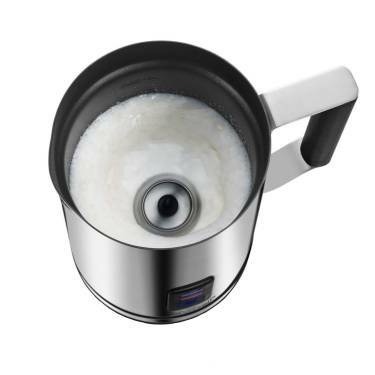 Therefore, whether you are a tech whiz or not, you will have this milk frother mastered in no time. To make hot frothed milk – Place the notched crown at the base of the milk jug and then proceed to add milk to your desired quantity. The jug has 2 clear markings for maximum and minimum levels. After that, place the milk jug over the Lavazza 18200057 milk frother’s base and cover with its lid, then press the multifunction button once & quickly. The appliance will automatically start heating the milk until it achieves optimum drinking temperature and a perfect milk-to-foam ratio. When the milk is ready, an audible beep will sound, so you can easily walk away and make the rest of your coffee as the milk froths. When making cold frothed milk – Follow the same procedure but use the smooth crown instead. You must also press the multifunction button for at least 3 seconds before releasing to activate the cold frothing function. A beep will announce when your cold milk is ready to pour. All parts of the Lavazza 18200057 are removable, so you will have an easy time cleaning the appliance. In fact, the lid, notches, and milk jug are all dishwasher safe. As for the base, wiping with a damp cloth is all that is required to keep it clean. It comes from a giant manufacturer: Lavazza is a famous Italian brand with 120 years of experience in making coffee. Their expertise is passed down onto this milk frother, allowing you to enjoy superb coffee as well as tasty milkshakes, cocoa, and more. Operates quietly: Thanks to an induction motor, this appliance froths your milk quietly. Available in different looks: Aside from the beautiful red model featured here, the Lavazza 18200057 also comes in stylish black and white colours. Features a small milk jug: With a maximum and minimum capacity of 180ml & 120ml respectively, the jug of this milk frother is not that big. This means that you will need to use the appliance several times in a row when catering to many people. 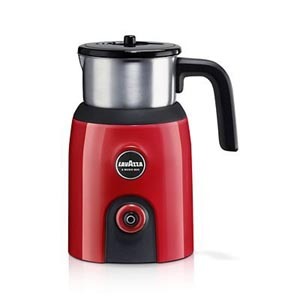 It’s hard to go wrong when shopping from a renowned brand and the Lavazza 18200057 is a perfect pick for those looking for a reputable electric milk frother manufacturer. Being a Lavazza product, this appliance has the art of frothing mastered down to a perfect consistency. What’s more, it is simple to operate, easy to clean, relatively affordable, and it will even look great on your kitchen counter-top. As for the product’s downside of being rather small, we believe that firing up the Lavazza 18200057 milk frother several times, will not seem like much of a sacrifice when you and your family, friends, or guests sit down to enjoy a cup of creamy cappuccino, some hot chocolate goodness, or a glorious milkshake. However, if you want something bigger, feel free to peruse the rest of our milk frother reviews. Inside its unimposing case a surprising amount of technology has been packed into the Aerolatte frother. This technology helps the Aerolatte to create consistently good foam every time you use it and ensures the appliance lasts for years. Plus, when you couple this with its incredibly low price point, it is easy to see why it is firm favourite for coffee lovers. How Does The Aerolatte Work? The Aerolatte uses specific technology designed to help ensure perfect foam and longevity. The first notable piece of technology is the ‘dry’ rotation speed and torque motor. This might sound a bit confusing and a bit like techno-babble. But, the end result of this improved motor is that you get a better foam using this device when compared to many other battery powered milk frothers. One of the reasons the speed of the motor is important is because if it spins too quickly or not fast enough a foam is produced which is a bit like of bubble bath or you end up with foam so dense you need a spoon to eat it. Secondly, the torque is also important because if it is incorrectly set it places excessive demand on the motor, which greatly reduces the life span of the appliance. The Aerolatte overcomes both of these problems ensuring a perfect foam every-time and gives you a reliable frother you’ll be able to depend on for years to come. Cleaning is an important consideration for any milk frother and you really don’t get devices much simpler to clean than this. A quick wash under the tap is all that is required to get it spick and span. Every now and then it is recommended to stick the whisk into some hot, soapy water to clean it throughly. Drying is equally as simple: switch on for 10 – 15 seconds and the Aerolatte will spin itself dry! The construction of this frother has been designed to withstand daily kitchen life. The screws are rust resistant and the battery contacts are nickel coated (which also prevents rust). The case itself it made from ABS. A tough plastic which is used in everything from car bumpers to protective head gear. So, this device should last for quite some time. Even if it gets more than its fair share of bumps and knocks. Of course, the downside of owning a battery powered frother it just that; it runs on batteries. So, if you think you’re going to use it a lot, and don’t want it to run out juice half way through frothing your milk, you may want to invest in rechargeable batteries of get an electric milk frother. 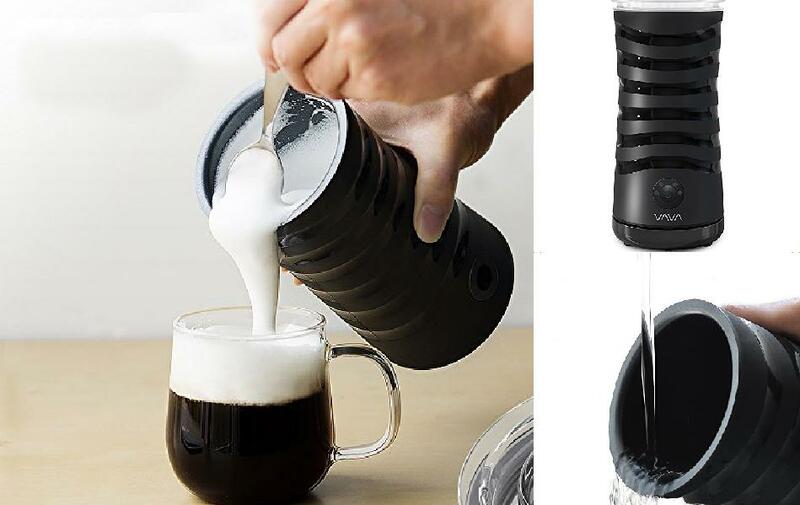 If you’re an occasional coffee drinker then this frother is for you. It is priced incredibly low, is easy to clean and engineered to last for years. We believe this handy gadget is worth getting if you don’t want to splash out on some of the pricier units and just want something to try out making milky coffees at home. Simplicity and sturdiness is the order of the day when it comes to the Bialetti Tuttocrema frother. It’s no fuss, robust design and lack of electronics means it is reliable, and very low maintenance. However, it does come with one major drawback: it does not automatically heat the milk. If this hasn’t put you off, and you don’t mind manually heating your milk. Let’s see what this frother has to offer. Because you’ll need to heat this on your hob (it’s made of aluminium and can’t go in the microwave) the Tuttocrema is designed to work on a variety of stove tops from gas or electric to ceramic. It also features a non-stick interior which is easy to wipe clean – great if you accidentally scorch the milk a little whilst heating – and it dishwasher safe making it one of the easiest frothers to clean. You can literally bung the entire frother into your dishwasher! The lack of automation in this device means there’s fewer things which could go wrong and the entirety of the device can be used to foam milk because no room is reserved for heating elements or motors. In fact, you can prepare up to 500ml of milk in the Bialetti Tuttocrema. Which should prepare up to six cups of your favourite coffee. This is by far one of the largest capacity frothers we’ve seen. An increase in the amount of foam you can create at any one time is not the only advantage the manually operated Tuttocrema brings. Because you heat the milk yourself you can get it to the exact temperature of you liking and because you manually froth the milk using the pump handle you can also prepare this to your preferred consistency. There’s not a lot wrong with this Tuttocrema, it’s cheap, should last for years and is easy to clean. Plus the Tuttocrema gives you greater control over how the milk is prepared. So, if you don’t mind doing a bit of work to get your frothed milk this device should suit you. However, if you DO want a hands off device that does everything for you we recommend you check out one of the electric milk frothers in our comparison table. When looking for a milk frother that will allow you to enjoy an instant, pleasingly rich creamy cup of coffee (or 2! ), the Jura 24029 should definitely be a top contender to include in your list. 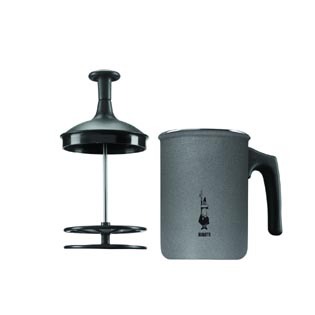 We found this Jura milk frother to be similar to the Lavazza 18200057 in many ways. 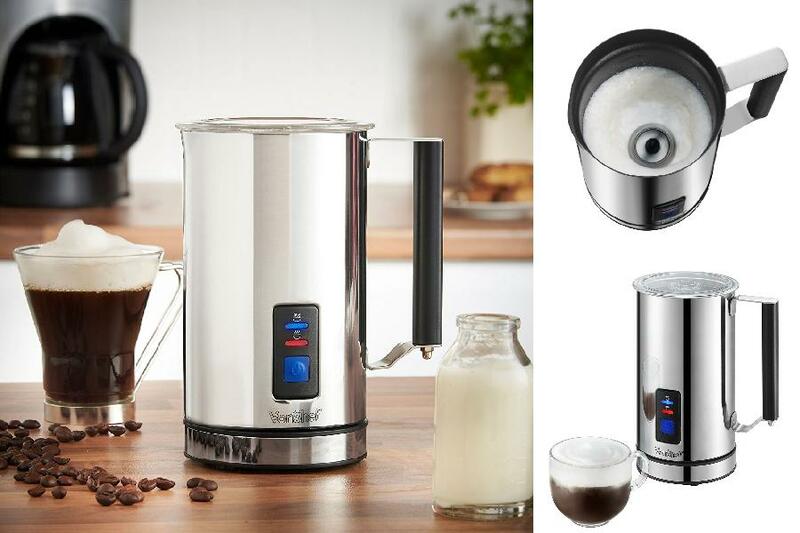 Both units come from reputable brands plus they are stylish, easy to use, offer multiple functionality, and deliver hot or cold frothed milk at the push of a button. Of course, there are some differences between the two appliances. So, read on to find out what the Jura 24029 has to offer. One of the appealing aspects we noticed right away about this milk frother is that it has a smart yet simple design. This machine allows you to prepare milk to make everything from caffè lattes and mochas, to hot chocolate and milkshakes. Making it incredibly versatile. 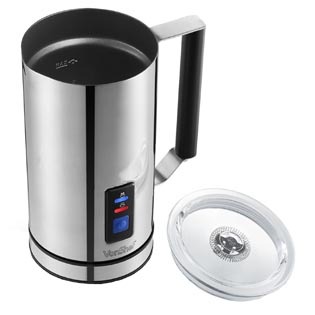 The 24029 comes with a black base and a stainless steel pitcher in chrome finish. 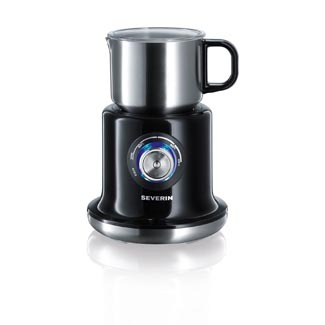 An innovative magnetic drive allows the pitcher to stick onto the base while a single button (located at the bottom of the base) activates the different functions of the milk frother. This appliance also comes with 3 ‘disks’ (these are essentially the whisk and stirring attachments). Two are for frothing (hot & cold) purposes and the last one simply stirrs the milk whilst it is being heated. Between the multi-function button and the 3 disks, using this appliance is pretty straightforward. These 5 simple steps are all you need to follow when frothing or heating your milk. Insert either a frothing or stirring disk (depending on what you are making) into the pitcher. Keep moving the disk around the centre of the pitcher until you hear it click into place. Add milk to anywhere between the MIN & MAX measuring marks indicated on the pitcher. Hit the power switch connected to the appliance and you are good to go! The only thing you need to master is how many times to press the setting button that activates various functions. For cold frothed milk, press the button once, twice for warm milk, and three times for hot frothed milk. A pictogram representing the mode you have selected will light up. After selecting your desired mode, its corresponding symbol on the control panel flashes three times. This machine starts and stops itself automatically, so there is no need to time the frothing duration or worry about scorching the milk. Once it stops running, the illuminated mode on the control panel also goes off, indicating that your milk is ready to serve. 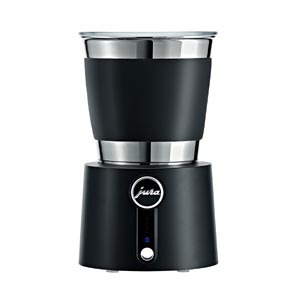 Another great feature to like about the Jura 24029 is that in addition to offering you a quick and zero-mess way of making frothed milk for your drinks, it is also easy to clean. Thanks to the magnet drive between the appliance’s base and milk pitcher, the stainless steel container easily detaches away, allowing you to carry it over to the sink for a quick wash and rinse. Compact Build: You will not have to worry about where to store the accessories that come with this milk frother. Thanks to a clever design, the power cord along with 2 disks can be conveniently stored at the bottom of the base unit. The third disk goes inside the pitcher when not in use, allowing you to keep all parts of the Jura 24029 together. Portable Design: Weighing about 1 kg and standing no taller than 21cm, this Jura milk frother is easily portable, allowing you to take the pitcher to your table and share with friends and family. This coupled with the fact that it powers up with an AC converter or car cigarette lighter means you can take your Jura milk frother on long road trips as well as camping adventures if you wish. Large Capacity: The MIN & MAX measurement markings on the pitcher are 8oz (236ml) and 12oz (354ml) respectively. Therefore, you can easily make drinks for 2-3 people in one go. Dual Automatic Shut-off: The milk frother shuts off automatically when done frothing. As an added precaution, you can interrupt the process yourself at any time by simply pressing the device’s button or lifting the milk pitcher from the base. The Jura 24029 does what it is advertised to do. It delivers velvety soft frothed milk with perfect consistency. So, you can easily make luscious Starbucks-like beverages from the comfort of your own home. The possibility of making an endless list of other recipes makes it an even more attractive product. However, you should know that this appliance takes a minute longer than some other machines to froth milk. But this is the only minor drawback we could find in this well-balanced unit. 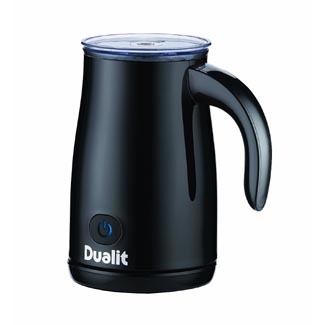 One of the first milk frothers we tested was the Dualit 84145. It impressed us with its high quality build, near silent operation and ease of use. And, despite it not being the most modern unit around, it is still a best seller with a plethora of positive reviews to back it up. Fitting a profile common to most mid-range milk frothers the 84145 features a base plate on top of which sits a detachable jug. The base of the jug is home to the whisk motor and heating mechanism which is used prepare the milk poured in to the top half. Once the frothing/heating cycle is complete the jug can be removed from the base plate for serving. During our tests we found that this frother could prepare about 2 decent sized cups of coffee in one frothing cycle – which is about average for a machine of this type. Using the device is very straightforward – simply pour some milk to the fill line, secure the plastic lid to the top and press the button located at the base of the unit once. Then in about 2 minutes you’ll have your hot, frothed milk! In total there are 3 different modes you can use to prepare your milk. Above I mentioned that a single button press with heat and froth the milk however, the Dualit 84145 has two other modes. The second mode is activated by pressing the button twice. This will cause the indicator light to flash red and in this mode it will heat and stir the milk but NOT froth it. To access the final mode you need to press and hold the button for about 2-3 seconds. This causes the indicator light to glow blue and and it will froth the milk but NOT heat it. Inside the jug there are handy fill lines which prevent you from over or under filling the device. The whisk mechanism is also marked with fill lines. This makes it very easy to see if you have too much milk in the machine and should stop any accidents where the device overflows. Most milk frothers hold the whisk in place using a spigot in the bottom of the machine. In the Dualit 84145 a magnet very cleverly locks the whisk in place and spins it. This makes just that bit easier to clean because the entire inside of the jug is smooth with no protruding parts to clean around. 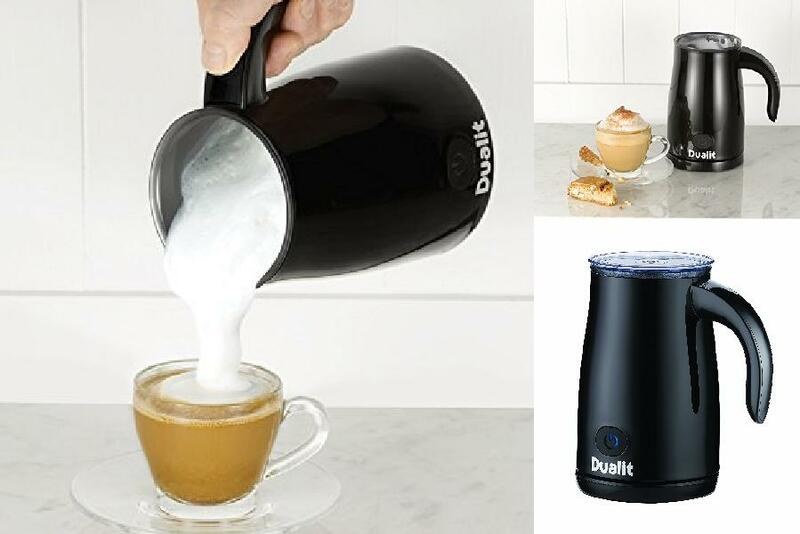 Whist there are some slightly cheaper alternative you could pick over this Dualit frother it still represents good value for money. It’s small, stylish and prepares milk in only 2 minutes making it ideal for any coffee lover who wants a no-frills, simple machine to make their favourite coffees anytime they want. Many coffee fanatics will argue that you have not truly enjoyed this dark beverage until you add a generous serving of thick frothed milk to the top of your drink. Frothed milk counteracts the strong taste of coffee by adding a bit of sweetness plus a whole lot of smooth creamy goodness that will delight your senses. The only problem is that going out to one of the (now numerous) coffee shops on our high streets and paying top money every time you want to enjoy a gourmet coffee is not a practical option for many. 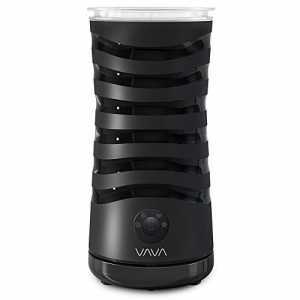 While you could try to whip up some homemade frothed milk (and pray it comes out as good as a barista’s) there is an easier alternative: the VAVA VA-EE0013UK Electric Frother, which delivers the perfect froth with one simple touch. No mess, no fuss, and a cheap way to bring café-style coffee into your home. Below we take you through the ins and outs of the VA-EE0013. The biggest advantage of electric milk frothers is that they froth effortlessly. You do not have to concern yourself with moving a plunger up & down repeatedly like in the case of pump frothers or handheld whisks to perfect consistency. With the VAVA VA-EE0013 in particular, you strike gold in this regard, as it is one of the easiest models to use. An ergonomic grip makes it easy and comfortable to hold the jar-like unit at any point. On the interior of the frother are 3 level markings labelled Min, Max, & Max in that order from bottom to top. The lower 2 markings deliver roughly 115ml of super dense foam (hot or cold), perfect for making cappuccinos and milkshakes. The top Max level indicator will give you 240ml of heated milk that is perfect for lattes, hot chocolates, and flat whites. Included in the package are 2 whisks for frothing (one is attached to the unit’s lid) and 2 heating whisks. To froth you simply insert your whisk of choice, add milk to the desired level, and hit the power button. You have 4 different settings to choose from including ‘Hot Dense Foam’, ‘Hot Airy Foam’, ‘Hot Milk’, and a ‘Cold Froth’. Another advantage of the VAVA VA-EE0013 is that it will not give you a hard time when cleaning up after use. The jar’s exterior is made of brushed stainless steel while the inside features a non-stick material. A quick rinse with water and a bit of soap will be enough to clean the unit. The modern kitchen today is usually filled with a ton of appliances. With this in mind, the VAVA VA-EE0013 is built in a sleek and compact design that ensures it will not gobble up valuable counter-top space. Standing a mere 4 inches (11cm) tall and 5.7 inches (14.5cm) wide, the frother is no bigger than a coffee flask. The lack of a handle also works to save up counter space. Another thing the VAVA VA-EE0013 saves on is electricity. 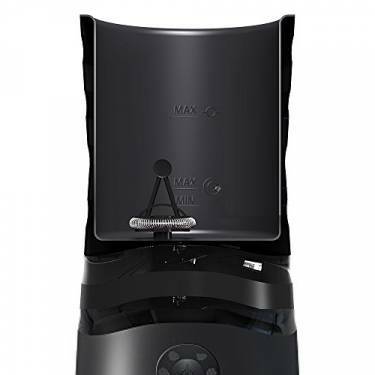 It is fitted with Strix Temperature Controller charged with the solitary role of automatically switching off the unit once your froth or milk is done. With a temperature of 60 degrees C to 70 degrees C, this frother may not be a good fit for people who love their coffee steaming hot. That temperature range however is perfect for lattes and cappuccinos. The VAVA VA-EE0013UK Electric Frother offers a simple and quick way to make professional coffee. With it, you can make different flavours every morning and thus fully satiate your love for coffee. With a sleek, modern design and compact build that will fit into any kitchen and not so high price making this frother is an all-round great buy. 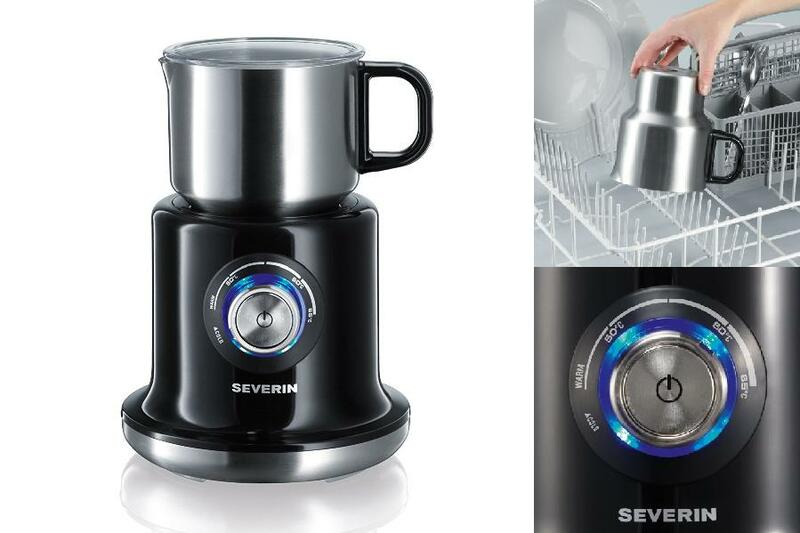 Not many people outside of Germany are too familiar with Severin products, but their range of milk frothers are causing quite a stir for coffee enthusiasts as more of us take to making our favourite coffee shop drinks at home. The SM9688 currently represents their flagship frothing product – and it is easy to see why. Its sleek case and compact footprint (measuring around 18cm at the base and 25 cm high) allows it to fit snugly in virtually any kitchen. Aesthetics aside we were curious to see why so many people are enamored with this unit. Let’s take a look at just what this device can offer. One of the things that sets the Severin frother apart from the competition is just how flexible it can be when preparing your milk. Not only does it come with two interchangeable whisking heads (one for frothing and one for stirring milk) it can also prepare your milk at a range of temperatures. In fact it can prepare milk cold right up to 65 degrees Celsius. Whilst this may seem somewhat trivial it does allow you to prepare things such as milkshakes and also get a hotter frothed milk for your coffee. Which is great if, like me, you aren’t partial to the luke-warm cappuccinos you can sometimes get at the coffee shops. To prepare the milk all you need to do is fill the stainless steel mug to one of two embossed fill lines – one denotes the fill level for frothed milk and the other for simply stirring the milk – and press power button to begin frothing. The supplied plastic lid clips firmly over the mug to prevent any spillages whilst the device is operating. Once the frothing/stirring cycle is complete the SM9688 emits a series of beeps to let you know your milk is ready and the power button flashes blue. A problem with heating milk in a pan is that the direct heat can sometimes cause the milk to burn and stick to the pan – unless you continuously stir throughout the heating process. 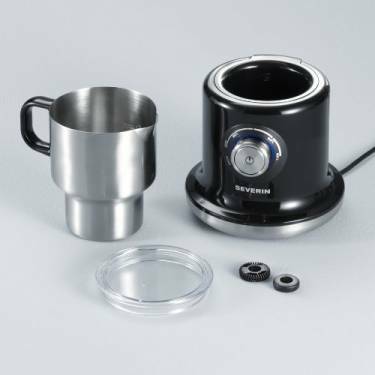 To prevent this the SM9688 uses an induction heating system which ensures direct heat is never applied to the stainless steel mug, preventing burning and making the device much easier to clean. In fact, both the stainless steel mug and plastic lid are dishwasher safe and completely removable which makes tidying up afterwards a breeze. Naturally with so many useful features and intuitive functions the SM9688 isn’t the cheapest frother available. But, if you’re looking for a well-built device which is not only easy to clean but can also prepare a lot of your other favourite drinks such as hot chocolate and milk shakes we believe the SM9688 definitely won’t disappoint. If you’ve read our milk frother reviews above you’ll know they come in all shapes and sizes. Here’s our guide to the main types available along with their pros and cons. Handheld frothers are invariably battery operated and consist of small hand held unit with a small round whisk protruding from one end. The whisk is held in a jug of milk and manually frothed until it reaches your desired consistency. Some people heat the milk before frothing, although cold milk is generally agreed to produce a better froth. There is a second kind you can buy which looks like a glass jar with a whisk built into the lid. We recommend you avoid these because they are prone to breaking and often do not have enough power to adequately froth the milk. The cheapest kind of milk frother you can buy. Simple to use and clean. Can be used to froth virtually anything from hot chocolates to cold milkshakes. For regular users the cost of buying new batteries could become expensive. You still need to manually warm the milk. Stove tops frothers consist of a metal jug and frothing pump attached to the top. The jug is partially filled with milk and placed on your stove until the milk has been heated through. The final step is to place the lid on the jug and pump the handle to produce the foam. Some people favour these because of their simplicity. There are no electrical components and the manual element to preparing the milk provides much more customization than some other types of frother. They are also generally very easy to clean and most can be placed in a dishwasher. Their simple design makes them very reliable and they have no electrical components which could break. You get complete control over how hot the milk is and how dense the froth is because this is all completed manually by you. They are dishwasher safe and easy to clean. You need to watch the milk to ensure it does not burn. With no temperature settings you need guess if the temperature is right for you or use a seperate cooking thermometer. With no automation you cannot leave this kind of frother to do the work for you. So it takes more of your time to make gourmet coffees. Electric frothers come in a variety of different styles and shapes. However, generally many look like small kettles and require nothing more than button press to heat and froth milk into a rich foam ready to make Cappuccinos and Lates. This kind of frother is the most variable you can buy. Some will only heat the milk to one temperature whilst others will heat it to a wide range of temperatures. You can even use some to prepare a multitude of different things from soups to milkshakes and hot chocolates, whilst other can only be used with milk. Despite there wide range of varying functionality, one key point remains the same: they are, by far, the easiest and most convenient frother to use. Simple operation requires no skill to use. Can be cleaned with either a rinse and wipe OR washed in the dishwasher (depending on the model). 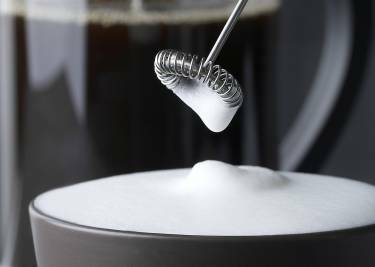 Many provide a variety of settings which allow you to vary the temperature and consistency of the foam. Some can be used to prepare other drinks such as hot chocolates and milkshakes. Come in a wide price range from around £25 to £100 and can suit any budget. Will not scorch or burn the milk. Some will only prepare the milk to one temperature and consistency. Some devices can only prepare a small number of drinks at any one time. How often do you plan on using your milk frother? Do you want to use it earlier in the morning before work or more in your leisure time? Do you want something thats hands-off or don’t you mind preparing the milk a bit yourself? These are the sort of questions you need to ask yourself before you buy, because they will help you identify a type of frother which will meet your needs. If you buy a frother purely because it is the cheapest available, but then realise you need a more automated unit because it takes too long to prepare a coffee before work, it will probably end up being tucked away in a kitchen drawer never to be used again. However, if you buy a top-end unit but then don’t use half of its functions because you just needed something simple, you will have paid out for features you’ll never use. Try to think about what you genuinely need and how often you really think you’ll use it. This will prevent impulse buying based on dazzling features or price and make sure you don’t waste your money. Ah, yes. Cleaning. A subject most of us are not keen on. Most milk frothers are very easy to clean these days. Some can simply be run under a tap whilst others need to carefully rinsed out and others still can be washed effortlessly in a dish washer. The more often you use your milk frother the more often you need to clean it. 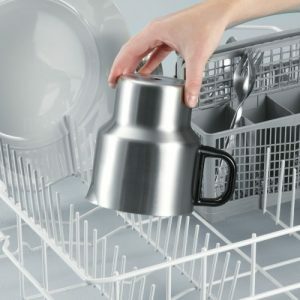 If you want something hassle free then a handheld unit or one which is dishwasher safe would probably be right for you. Again, making sure how you clean your frother suits you will ensure it does not become tucked away in kitchen cupboard because nobody can be bothered to clean it after it has been used. Price is something of a misnomer. However, it is important. Most people know their budgets so I won’t insult your intelligence by saying only buy what you can afford etc. What I will say is that price can sometimes tie into features but, the most expensive device does not always mean it comes with the best features for you. Shop around a bit. Can you find a device that offers everything you need at a cheaper price or by a less expensive brand? Our list covers most major milk frothers and a variety of prices but it is by no means exhaustive if you can’t find what you need try browsing a full range of milk frothers here. With so much choice it can be difficult to know what to buy and what you can expect from your milk frother. We hope this guide has helped demystify the jargon and make purchasing one that bit easier. Take another look at our comparison table to quickly compare a spread of some of the best and varied frothers available. 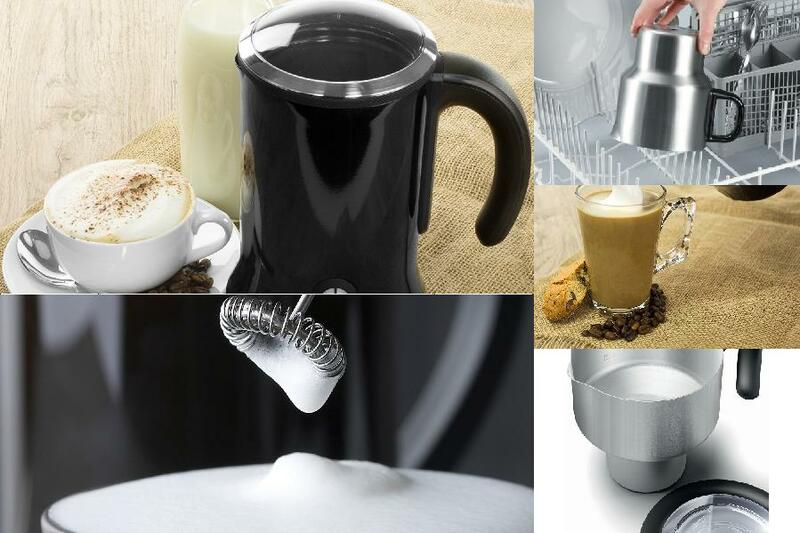 Re-read our guide on the different types of milk frother to familiarize yourself with pros and cons each has to offer.